Over the course of the last three years, the Middle East Institute convened a regional dialogue involving participants acting in their personal capacities from Egypt, Iraq, Iran, Jordan, Lebanon, Saudi Arabia, Syria, United Arab Emirates and Turkey. The dialogue also involved participants from China, Europe, Russia and the United States. The discussions resulted in the following declaration of good neighborhood principles for the Middle East agreed in Baghdad 15-16 December 2017. The Middle East dialogue, which began its twice-a-year meetings in October 2012, convened its eleventh meeting in Baghdad 15-16 December. Participants included current and former officials and senior experts from Egypt, Iraq, Iran, Jordan, Lebanon, Saudi Arabia, Syria and United Arab Emirates as well as China, Europe, Russia, and the United States. The Middle East Dialogue, a regional Track 1.5 group in which officials and non-officials from the region and beyond meet to discuss current issues in their personal capacities, met May 12-13 in Malta. October 17, 2017 - Joseph S. Pennington, Deputy assistant secretary for Iraq, delivers keynote at half-day conference, "Iraq's Political Compact and Its Regional Priorities,"
The Middle East Institute's Initiative for Track II Dialogues seeks to establish spaces for current and former officials and senior experts from the Middle East, the United States, Russia, China, and the EU to engage on a regular basis in policy-relevant, problem-solving dialogues in which they discuss emerging political and security trends in the region, resolution of regional conflicts, and broader issues that are related to regional security. Track II dialogues help participants gain a keener understanding of each other's perspectives about the issues under consideration, provide platforms to formulate and test options for new solutions for conflicting issues, and generate insights that help expand officials’ understanding of the issues. In some cases, an outsider third-party team convenes the dialogue and facilitates the discussions. In other cases, some dialogue participants also serve as facilitators. Track II diplomacy has become an increasingly important part of the evolving international political landscape. 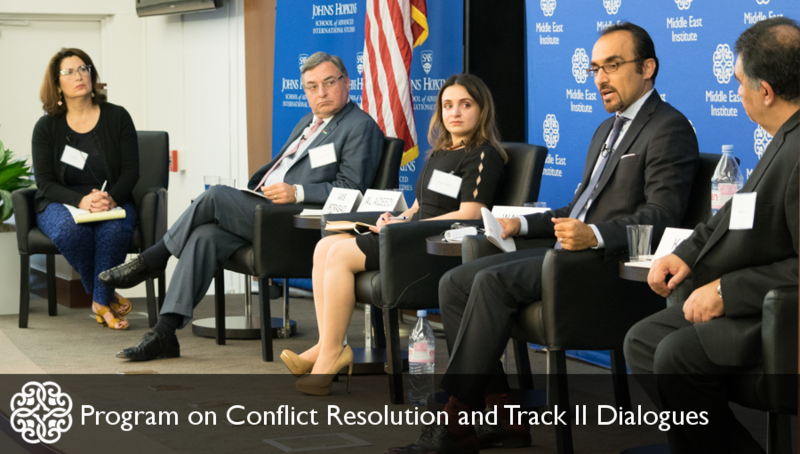 Track II dialogues work both as a conflict prevention and management tool and as an important component of peace-making strategies. Private foundations, non-governmental organizations, and universities are involved in these types of activities and have devoted significant resources to them. What is Track II Diplomacy? The Middle East Institute's Initiative for Track II Dialogues seeks to establish spaces for current and former officials and experts from the Middle East, the United States, Russia, China, and the EU to engage in policy-relevant, problem-solving dialogues in which they discuss emerging political and security trends in the region, resolution of conflicts, and broader issues that are related to regional security. The initiative's primary focus is the Iraq-Syria-Lebanon conflict axis.